Part 1 of the course will review thyroid physiology, thyroid hormone production, conversion and metabolism, in addition to, differentiating the 6 main hypothyroid patterns and presentations most often encountered in functional blood work. The course will also discuss: Common underlying causes contributing to the development of the various forms of hypothyroidism, how hypothyroidism impacts and disrupts other hormone pathways and the body’s overall physiology, specifically pertaining to female reproductive function, as well as, discuss herbal, dietary and nutritional treatment options for the 6 main hypothyroid patterns discussed. Part 2 of the course will go into more detail discussing the patho-physiology of the autoimmune hypothyroid condition, Hashimoto’s Thyroiditis and it’s impact on female fertility. The course will review the diagnostic criteria and clinical presentation specific to the Hashimoto’s patient, as well as, examine the “Neuro-Endocrine-Immune” Axis interplay of Hashimoto’s. There will also be a thorough discussion and explanation of the laboratory immune markers associated with Hashimoto’s and their clinical relevance, as well as, reviewing and understanding the immune response at play associated with Hashimoto’s. This information will help to guide and inform the practitioner’s clinical treatment. The common treatments for Hashimoto’s including, medical, surgical, herbal, dietary and nutritional interventions will also be discussed. Part 2 of the course will finish up by reviewing the Chinese medical theory and pattern differentiations of Hashimoto’s and the Chinese herbs and formulas commonly and traditionally used in the treatment and management of Hashimoto’s, in addition to, looking at some of Dr. Gina’s research on Chinese and Traditional herbal remedies used to modulate the immune system and the associated immune markers seen in the Hashimoto’s patient, support thyroid hormone production and positively influence fertility markers. Part 1: Diagnosing, Differentiating and Discussion of Treatment options for the 6 main Hypothyroid patterns and their impact on Female Fertility. Obtain a thorough understanding of thyroid physiology, thyroid hormone production, conversion and metabolism. Learn how to differentiate the 6 main hypothyroid patterns and presentations most often encountered in functional blood work and clinic. Learn about the common underlying causes contributing to the development of the various forms of hypothyroidism. Learn how hypothyroidism impacts and disrupts other hormone pathways and the body’s overall physiology, specifically pertaining to female reproductive function. Learn about herbal, dietary and nutritional supplement treatment options for the 6 main hypothyroid patterns discussed. Learn about the patho-physiology of Hashimoto’s Thyroiditis and it’s impact on female fertility. Learn the diagnostic criteria and clinical presentation specific to the Hashimoto’s patient. Understanding the Neuro-Endocrine-Immune” Axis interplay of Hashimoto’s. Understanding the specific immune response at play associated with Hashimoto’s. Learning about and understanding the laboratory immune markers associated with Hashimoto’s and their clinical relevance. Learning about the common treatments for Hashimoto’s including, medical, surgical, herbal, dietary and nutritional supplement interventions. Learning about the Chinese medical theory and pattern differentiations of the Hashimoto’s patient and the Chinese herbs and formulas commonly and traditionally used in the treatment and management of Hashimoto’s. Thyroid physiology, Thyroid Hormone production pathways, Thyroid hormone conversion and metabolism. Thyroid hormone lab markers and Thyroid Antibodies, what they mean and how to interpret results. Clinical presentation of the Hypothyroid patient. Differentiating the 6 main Hypothyroid patterns. Common Underlying Causes contributing to the development of the various forms of Hypothyroidism. How hypothyroidism impacts and disrupts the body’s mechanisms specifically pertaining to female reproductive function. Commonly prescribed Thyroid Hormone Replacement medications. Dietary and nutritional treatment options for the different hypothyroid presentations. Discussion of Common Chinese Medical Patterns associated with the Hypothyroid patient. Discussion of Chinese Herbal Treatment Options. Understanding what Hashimoto’s is and the etiology and Immune patho-physiology underlying its development and progression. Understanding the “Neuro-Endocrine-Immune” Axis interplay of Hashimoto’s. Immune response associated with Hashimoto’s. Understanding Immune Markers associated with Hashimoto’s and their clinical relevance. Clinical Presentation Specific to the Hashimoto’s patient and what to look for. Patho-physiology of how Hashimoto’s and the associated hypothyroidism disrupts the body’s mechanisms, specifically pertaining to female reproduction and fertility potential. Common Treatments for Hashimoto’s including, Medical, Surgical, Dietary and Nutritional interventions. Understanding the shortcomings & side effects of medical treatments used to manage Hashimoto’s. Chinese medical theory and pattern differentiations of Hashimoto’s. Herbs and Herbal formulas commonly used in the treatment and management of Hashimoto’s. 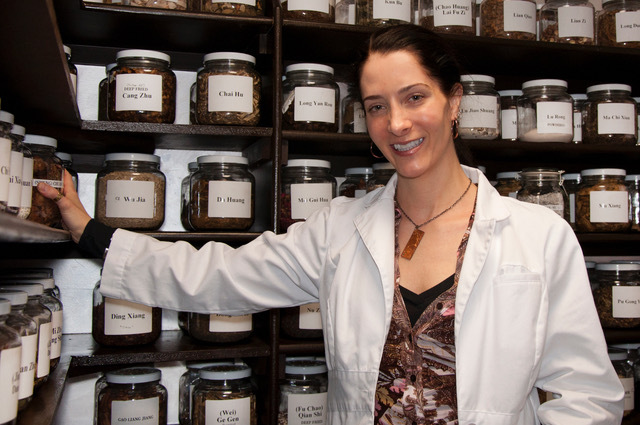 Learning about the herbal formulas and single herbs investigated in Dr. Gina’s research and how they are viewed according to their corresponding Chinese Medical diagnosis, in addition to their impacts on immune, fertility, thyroid, adrenals and gut markers. Dr. Gina did a phenomenal job in ALL areas! The amount of work that went into the research and making of the power point presentation was excellent! I will use this material as reference in my practice daily. The only thing I have to say is "the gut" topic could have used it's own entire day. A good and thorough refresher of the Western Med portion of the material and helpful Chinese Med formulas for the conditions. The course was very extensive and covered a lot of information. I wish it had focused more on the effects Hashimoto has on infertility as this was what I was expecting from the course. But overall it provided excellent information on autoimmune diseases and Hashimoto. I treat many hypo and hashimoto patients. It seems to almost be an epidemic so the deeper my understanding the more effective I am to my patients.